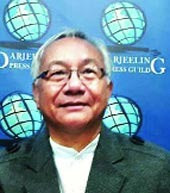 The All Christian Minority Central Committee, whose patron is Bishop Stephen Lepcha of the Darjeeling Diocese, today passed a resolution to stick to the demand for a separate board for the Christian community in the region. The decision of the committee comes after chief minister Mamata Banerjee formed the West Bengal Pahadia Minority Board on February 13, taking representatives of the Christians, Muslims, Buddhists and other minority communities in the hills, like Bengalis and Marwaris. The notification states that the board will be under the control of the state's minority affairs and madarsa education department. Bishop Lepcha today said: "The committee held a meeting today to have a discussion on the recently declared Pahadia minority development board and the house arrived at a conclusion that while we have no objection (to the board), we stick to our demand for a separate minority development board for Christians." Lepcha said the All Christian Minority Central Committee had made various representations to the state government and still, it hadn't been consulted before finalising the details of the board. Father Solomon Subba of the United Christian Minority Organisation, which is not part of the committee, has been made the chairman of the board, while Arif Khan the vice-chairperson.